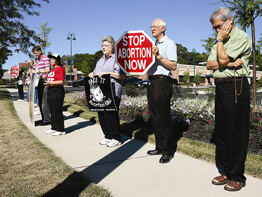 Clutching rosaries and holding signs in support of the sanctity of life, 12 Catholics stood on the sidewalk outside an Overlea shopping center July 21 and peacefully asked God to end abortion. As cars whizzed by along Belair Road, the middle-aged men and women recited the rosary and the chaplet of divine mercy – standing within walking distance of a women’s health center that provides abortions. The demonstrators have been gathering every third Saturday of the month for several years. They always begin the day with a prolife 8:15 a.m. Mass at St. Joseph in Fullerton. While some participants pray publicly on the sidewalk after Mass, others remain at St. Joseph to pray privately for a greater openness to the culture of life. “I think prayer can do anything,” said Marilyn Halle-Webster, a parishioner of St. Isaac, Carney. While she doesn’t know any women who changed their mind about having an abortion as a direct result of her efforts, Ms. Halle-Webster believes the prolifers on Belair Road are making an impact. They might have helped save lives they will never know about, she said. “Women who see our signs might just think twice about having an abortion,” she said. Tom Hughes, a parishioner of St. Joseph, Fullerton, said about 80 percent of passersby ignore their prolife effort. About 10 percent respond with thumbs up or supportive beeps on their car horns. About 2 percent react negatively, he said. “I’m here to save babies,” explained Mr. Hughes, who brought a large image of Our Lady of Guadalupe, patron saint of the unborn. “It’s a huge number of babies who are lost every year to abortion,” he said. During his homily at the prolife Mass, Rev. Mr. John Rapisarda told worshippers that 1.2 million children have been killed through abortion since 1973 in the United States. Rev. Mr. Rapisarda emphasized that just as Catholics pray for an end to abortion, they must also pray for women who have had abortions. “We need to have absolute and complete compassion and mercy for all the victims of abortion – mothers and babies,” he said.